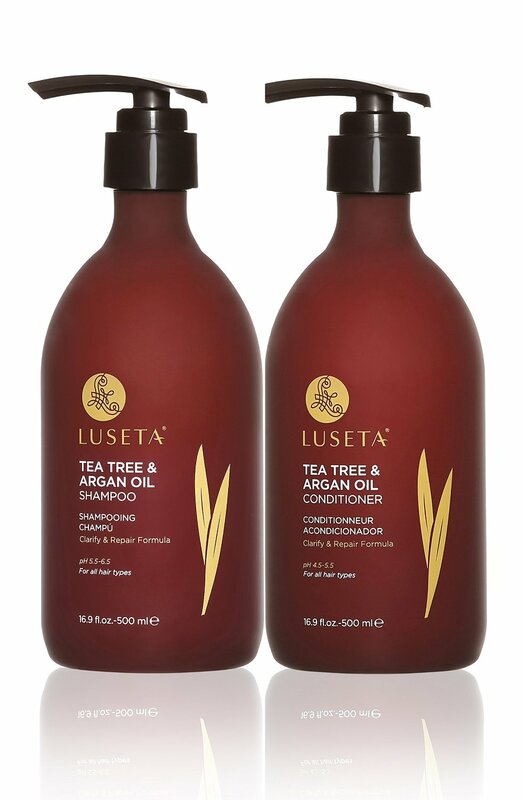 Bookish Lifestyle: Beauty Review: Luseta Beauty Tea Tree and Argan Oil Shampoo and Conditioner + $100 Giveaway! 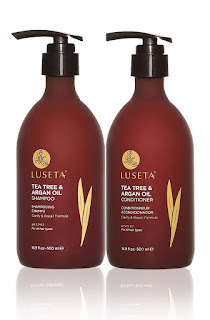 Beauty Review: Luseta Beauty Tea Tree and Argan Oil Shampoo and Conditioner + $100 Giveaway! Finding the right shampoo for yourself isn't as easy as finding the right shade of lipstick, or a perfectly matched foundation, and I have learned that the hard way. Especially if your hair tends to get greasy close to the scalp, while being completely dry at the ends. It's challenging. For me, having healthy looking hair is important. After my pregnancy, I have lost quite a lot of hair and it's only just now starting to grow back. My hair is fair and falls out easily at the lightest pull. It's also quite damaged from always being tied into a ponytail (it's either that, or being pulled out by fistfuls by the little one). I am yet to find a shampoo and conditioner that I could call my holy grail, but the Luseta Tea Tree and Argan Oil line is one of my top three favorite hair products of all time. So far, I've had the most success with the Luseta products, the Ginger Shampoo from The Body Shop and the Argan Oil line from Seaweed Bath company. These are the only products that thoroughly clean my hair, moisturize and keep my scalp healthy at the same time. The Luseta Tea Tree and Argan Oil shampoo lathers well and cleans pretty thoroughly. I feel like the Argan shampoo from the Seaweed Bath company gives you a more squeaky clean feeling than the Luseta one, but I'm not sure if that's a good thing, because I feel like it might be stripping my scalp of the good things as well. 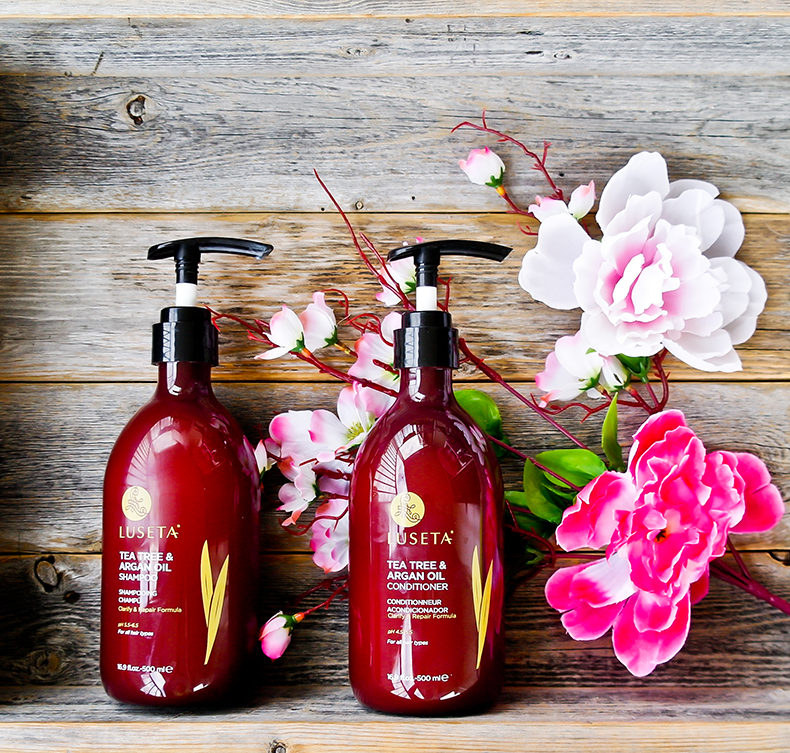 The Luseta shampoo cleans well without leaving my scalp dry, which actually feels better. The consistency is great (not too thick, not too runny), the color is a pearly light green and the smell is very invigorating. Surprisingly, it doesn't smell like tea tree oil, it smells more like peppermint, which is great for those bothered by the tea tree scent. I personally wouldn't mind either way. I wash my hair twice, two pumps of shampoo each time and that keeps them clean for about 2 days. The bottle is very large and the shampoo lasts very long, so that's a big plus. I like the cooling effect of this shampoo, and the gentle tingly feeling on my scalp. As someone who suffers from dry and itchy scalp, I can definitely tell you that finding a shampoo that keeps your scalp happy is probably even more important than finding one that will make your hair look great. Well, Luseta does both, that's why I'm so pleased with it. With most of the shampoos I've tried so far, my scalp would get very irritated, to the point I'd be scratching almost constantly. The three brands I mentioned in my review earlier are the only ones that help keep my scalp healthy. The tea tree oil in the Luseta shampoo and conditioner has antimicrobial and antibacterial properties, and the argan oil provides proper nutrition and moisturizes well. It's a perfect combination. The conditioner smells a bit different than the shampoo, but it's also a pleasant, earthy kind of fragrance that doesn't really last long. It works great for me, doesn't leave my hair feeling artificially silky smooth, but it takes away the roughness and makes them soft and naturally moisturized. They don't get tangled up as much as they used to, either. Overall, this is honestly a really great brand worth checking out. If you have dry and damaged hair and scalp that could use an extra boost of nutrition, I recommend checking Luseta out. Disclaimer: A free sample of the products has been provided in exchange for my honest review. Most widely known and used for its antiseptic and antibacterial properties, tea tree oil is effective in thoroughly cleansing and improving the health of the scalp, removing any impurities, and acting as a natural antidandruff remedy. Combined with the nourishing and restorative properties of pure organic argan oil, Luseta Tea Tree & Argan Oil series works to leave the scalp feeling refreshed while locking in moisture and shine into each strand of hair. You can win $100 to Luseta Beauty store and get pampered with us! :) (well, not with us, we won't be there, that would be creepy).